"Take control of what's below and what's above will follow. In other words, everything." "Fresh blood coveting the darkness and jet black flowers...I ride Edel Rose!" Anime Biography: King of the underground fighters, Jun is a ruthless gang leader who disregards the rules of Vanguard, cardfighting under ante rules for his own personal wealth. Having grown up in a hostile environment where trust is seen as without value, Jun holds his position over the underground fighters by deceiving others in order to stand alone in the underground's deepest throne. Despite this anarchist behavior, Jun is the lone member of the underworld to otherwise play strictly by the rules. In addition to his prowess as a Vanguard fighter, the king is shown to be proficient with a makeshift chain whip, putting it to use to intimidate his opponents and force them into ante fights. First sought out by Kai Toshiki in ride 36, Jun answers his call by kidnapping Miwa Taishi and using the boy as his ante against Kai. Demonstrating his skill as a Vanguard fighter and the underground fighters' prototype motion figure system, Jun ultimately loses the fight. After this, Kai reveals the truth--that he sought out Jun because he heard that Mutsuki was the strongest of the Dark Irregulars fighters. Toshiki concludes that Jun pales when compared to Tetsu. Releasing Miwa, Mutsuki briefly wonders what it would be like to have a friend like Kai. Disregarding this thought, his next appearance is in ride 44, where he observes Kai using his underground fighters' as a means to take his anger out on. Witnessing Kourin and Kai's fight in the same episode, he corroborates with Kourin in rides 49-50 to loan Kai use of the motion figure system, and break Aichi free from his other self's hold. Jun is not seen again after this. Jun prefers to open the first move with Alluring Succubus over Vermillion Gatekeeper; although she possesses lower power and thus inferior defense to Prisoner Beast, by combining the two units' skills Jun is able to get a soulcharge 2 off right from the beginning of the game. This is the start of a general trend in his deck--the king's Dark Irregulars deck opts for low-power rides and calls that favor soul building to feed his stronger units. 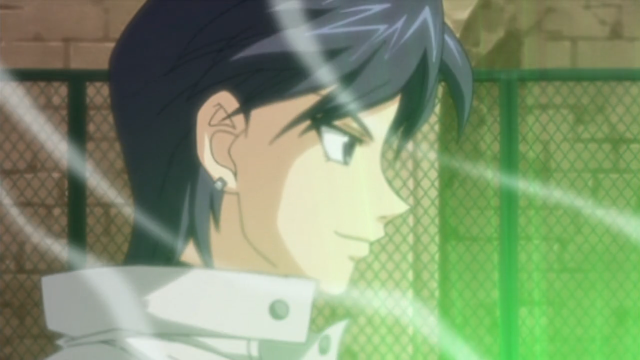 Jun's deck can be said to have the characteristics of a weak but skilled construction, especially compared to the other main Irregular cardfighter seen in season 1, Tetsu. His preferred grade 3s are Edel Rose and Demon Eater, with Rose taking priority. While unusual for a deck so strongly geared around soulcharging, Jun only uses the Eater as an alternative vanguard when luring his opponent into a false security, as her megablast is very easy to interrupt. Despite Kai calling out Jun as the inferior fighter, when compared with Tetsu it's clear that Jun has the stronger earlier game. Tetsu comes out on top because of his powerful late-game maneuvers and sound deckbuilding. Even though Jun begins his games with the lead, he lacks the ending force that Shinjou brings to the field.